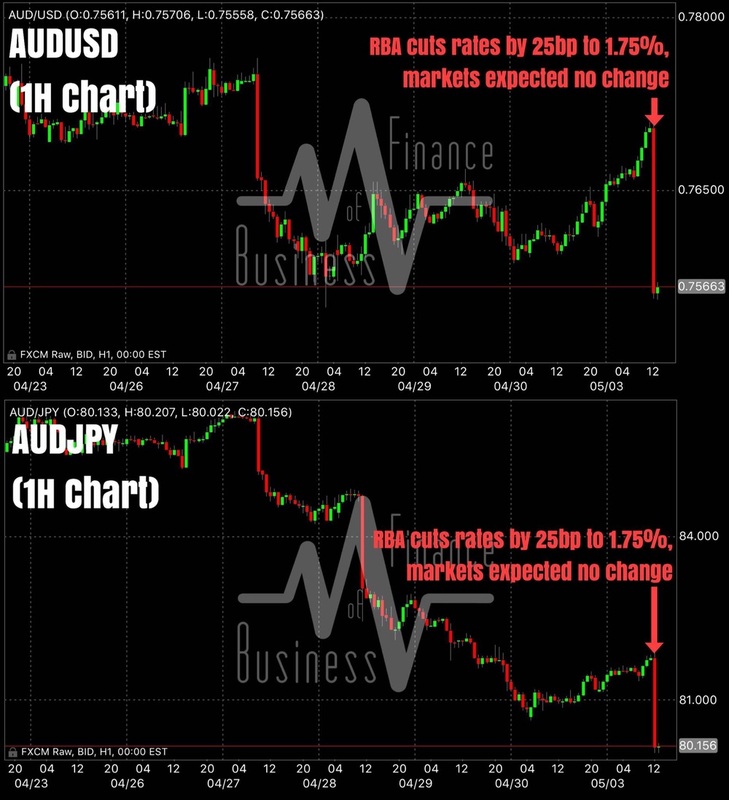 "The Aussie dollar is plunging today after the Reserve Bank of Australia (RBA) unexpectedly cut interest rates by 25bp from 2% to the current 1.75%. This follows last week's record low Australian core CPI inflation, and overall sluggishness in its economy. On another note, if China is what it really claims it is (soaring commodity prices and industrial profits) then why would Australia (China is Australia's largest trade partner) need to ease monetary policy? Think about that." The U.S. dollar depreciated against major currencies such as the Japanese yen, euro, and pound sterling after the Federal Open Market Committee (FOMC) decided to hold rates unchanged in April. Last Wednesday saw a "hawkishly-dovish" Fed. Adding insult to the dollar injury was Thursday's shocking inaction from the Bank of Japan (BoJ) as the Japanese central bank too decided that waiting for more data to measure the true impact of its earlier quantitative easing efforts was a prudent course of action. "While we have been writing extensively on the weakness of the U.S. dollar and resulting strength in commodities such as the precious metals (gold, silver, platinum), we can not give less of a damn when it comes to being realistic. Now is the time to be realistic, we feel. Just on the technical side of the market (price action and market structure), the DXY (U.S. Dollar Index) is currently at its May 2015 lows which is a key technical support area. 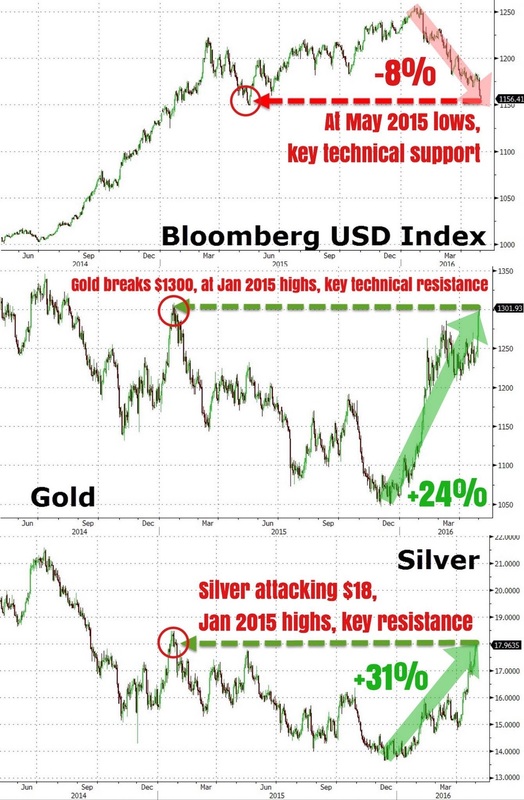 Gold and silver are conversely at their January 2015 highs which are both key technical resistance areas. Gold managed to trade briefly above the key psychological big figure of $1300. Since their respective inflection points, the DXY is down -8%, gold up +24%, and silver +31%. These are some seriously big numbers that were talking about. 8% is a huge deal for a currency index, for the lesser learned of you. We aren't bearish the precious metals or bullish the USD. In fact, if you've been following us, we have been advocating long exposures in the precious metals complex since early February, and have been shorting the USD since around the same time. This is merely a heads up to traders and opportunistic folks, if you get what we mean. Trade accordingly..."
The result was a widespread capital flight from the greenback, which heavily benefitted most other major currencies. Market participants sold the dollar as the Fed continued its cautious stance; the June FOMC event only has a 11.3% of implied probability of a rate hike, according to the CME's FedWatch. The same method of analysis implies a 24.2% and 36.1% likelihood for a July and Septemer hike, respectively. Even if we do get positive employment data this Friday, the market believes that it will only have a small impact on the Fed's decision in June, unless wage inflation picks up. "It keeps getting worse... And worse... And worse... Until both U.S. manufacturing PMI and ISM composites head into contraction; we're just a hairline away from the 50 mark. Both widely watched macro indicators have been declining consistently since August 2014, with ISM dipping below 50 to lows of 48 in December last year! 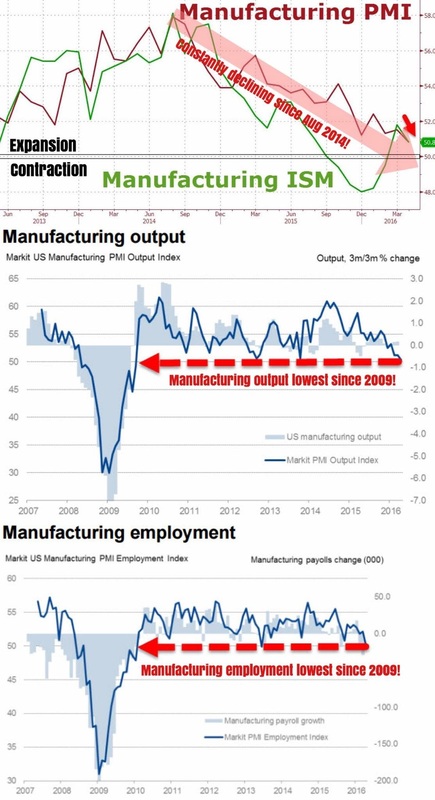 Both the PMI manufacturing output and employment are currently at 2009 levels, when the American economy was still reeling from the aftershocks of the grimmest recession since the Great Depression. Yellen, we have a problem." Employment remains the strongest pillar in the "recovery" of the American economy, but wage growth has been low. Questions about the quality of jobs available have also surfaces, alluding to the the massive additions of part-time jobs relative to full-time ones. U.S. initial jobless claims are at 43-year lows but consumers are not spending. Regardless, the consensus expectation is for an addition of 200,000 new jobs to the U.S. economy, down from March's 215,000 print. The U3 unemployment rate is expected to hold firm at 5.0%, but the focus will almost certainly be on wage inflation.